St. Rose, born in Lima, Peru, was the first person from the Americas to be canonized a saint (1671). 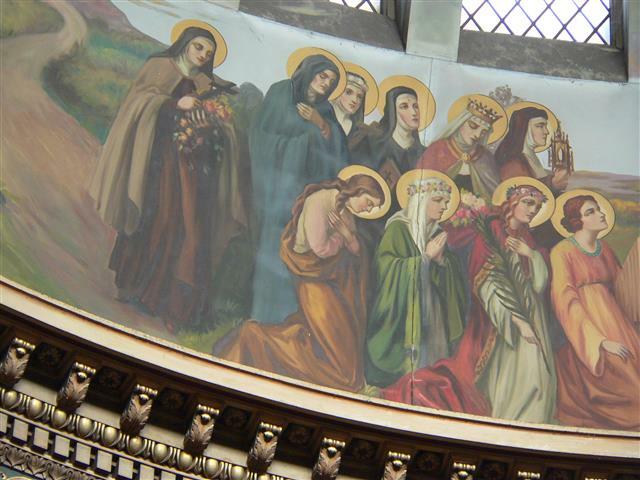 She is depicted in a grouping of “Virgins and Widows” in the great dome of our church as the second kneeling figure on the left, wearing a crown of roses. St. Rose is the patroness of embroiderers, gardeners, florists, people who suffer family problems, and those who suffer ridicule for their piety. Artist: Joseph Mazur. Photo credit: Gary Kelley. 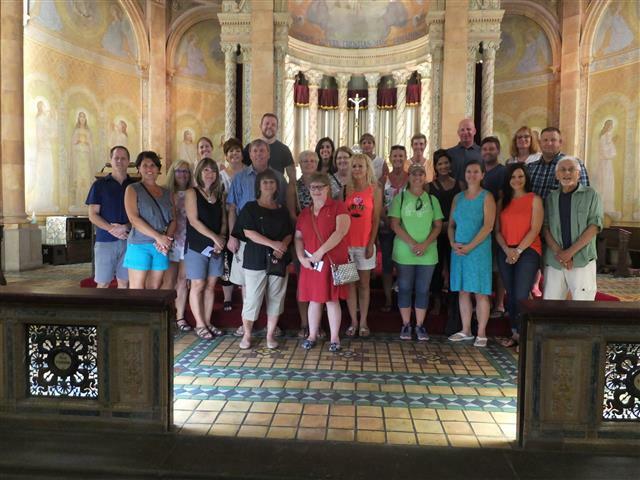 Blessed Trinity Part of “Summer School” Curriculum ~ Twenty-five teachers from the Lewiston-Porter School District, accompanied by local preservationist Tom Yots, participated in a docent-led architectural tour of our church on Thursday, August 18. We thank them for choosing to visit Blessed Trinity as part of their summertime professional development program. #44 – Dignity of Human Life – We know all human life is sacred from womb to tomb. Catholic teaching about the dignity of life calls us to oppose torture, unjust wars, and the indiscriminate use of drones for violent purposes; to prevent genocide and attacks against noncombatants; to oppose racism; to oppose human trafficking; and to overcome poverty and suffering. #46 – Subsidiarity – The human person is not only sacred but social. Full development takes place in relationship with others. The family is the first and fundamental unit of society. Respect for family should be reflected in every policy and program; we must uphold parents’ rights and responsibilities to care for their children, including the right to choose their children’s education. A Network of Caring ~ When you call on Catholic Charities, you connect to a wealth of support. From professional counseling, mental health assessments, senior support, troubled teen programs, parenting to education and work readiness programs and more, we’ll respond with goals to grow stronger together. For more information, call 856-4494 or go to www.ccwny.org. You can also find us on Facebook, Twitter and YouTube. 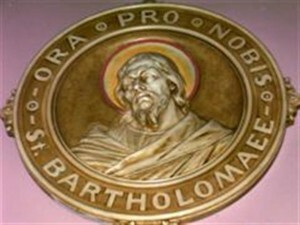 This ceramic medallion of St. Bartholomew originally hung in St. Bartholomew R. C. Church on Grider Street in Buffalo. Since the merger of our parishes in 1993, it has hung on the wall of the transept on the right (west) side of the church.